About: Uveitis is an inflammation of the uvea, which is the middle layer of the eye. Causes: There are a number of causes including immune-mediated, diabetes, cancer, trauma, infectious and high blood pressure. Symptoms: Cloudy or red appearance to the eye(s), abnormal pupil size, sensitivity to light, change in pupil shape. Treatment: Find and address the underlying cause and anti-inflammatory medications and in some cases, atropine to dilate the pupils which may relieve discomfort. Uveitis is a painful eye disease in which the uvea, (the pigmented layer that lies between the inner retina and the outer fibrous layer composed of the sclera and cornea) becomes inflamed. 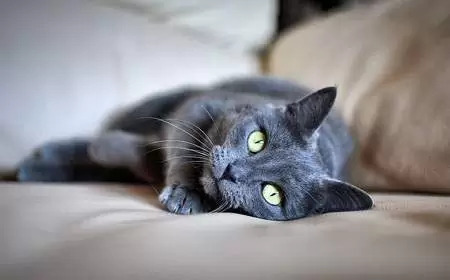 It is one of the most common eye disorders in cats and can be potentially very serious. The disease is classified according to the layer(s) involved. There are many causes of uveitis, such as trauma, infection (bacterial, viral or fungal) and cancer. In many cases, an underlying cause can not be established, this is known as idiopathic. Eye tumours, the most common being diffuse iris melanoma and lymphoma. Lens-induced anterior uveitis is caused when the lens capsule breaks open leaking fluid into surrounding tissues, which causes an inflammatory response. Other causes include hyper-mature cataracts and lens luxation. Note the reddened eye in the photo of Ella. Her uveitis was caused by immune-mediated hemolytic anemia of unknown origin. She made a full recovery. Click on the image above to see full size or the link below to see more photos of Ella’s uveitis. 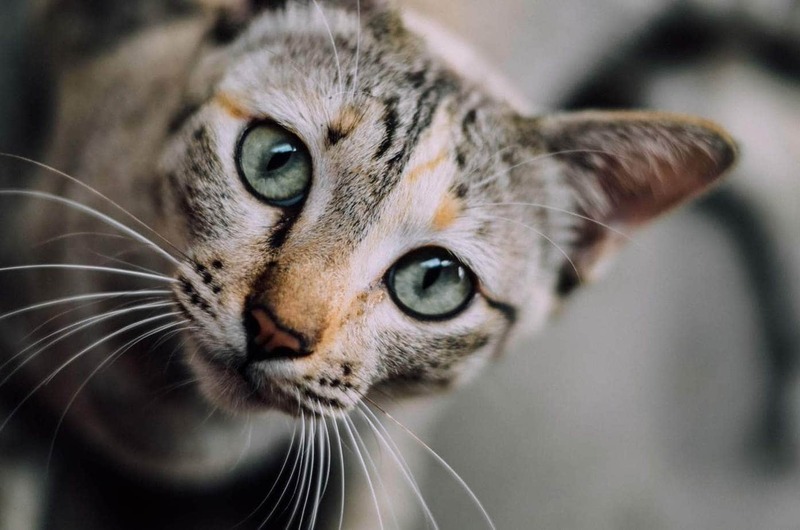 Your veterinarian will perform a complete physical examination of your cat, including a thorough examination of the eyes to look for possible trauma. He will obtain a medical history from you including any other symptoms you may have noticed or recent illness. Blood pressure test to check for hypertension. Thoracic X-rays to check for fungal diseases or tumours. Ultrasound of the eye if an injury is suspected. Ultrasound to look for fluid in the abdomen (if FIP is suspected). Fluorescein staining to evaluate for corneal ulcers. Tonometry to check the intraocular pressure of the eye. Uveitis usually results in lower intraocular pressure, however, with chronic cases, cats can often develop secondary glaucoma. Examination of the eye with an ophthalmoscope, a small handheld device which enables your veterinarian to examine the inside of the eye. Handheld slit-lamp examination looks at the front of the eye under magnification. Unfortunately, while your veterinarian can diagnose uveitis reasonably easily, finding the underlying cause is not always possible with between 60-75% of cases being idiopathic (unknown cause). Treatment of uveitis is aimed at treating the underlying cause, if it is known, reducing inflammation, relieving discomfort and preventing further damage to the eyes. Left untreated, uveitis can result in blindness due to glaucoma, cataracts, dislocation of the lens (lens subluxation) and detachment of the retina. In some cases, the veterinarian may refer you to an ophthalmologist to manage your cat’s uveitis. Topical anti-inflammatory drugs to reduce inflammation. Topical atropine to dilate (enlarge) the pupils, this helps to reduce pain and stops the inflamed iris sticking to the pupil. Control and manage diabetes with diet and/or insulin injections where necessary. Supportive care and anti-viral medications (where available) for cats with viral infections. Eye removal surgery (enucleation) for cats with tumours of the eye. Surgery and/or chemotherapy for cats with other forms of cancer. Steroids to manage immune-mediated disorders. These medications can help to suppress the over-active immune system. Follow-up care will be necessary to monitor progress. Unfortunately, uveitis is a disease which frequently recurs and may require lifelong treatment. Cat Not Eating – How Can I Get My Cat To Eat? Can I Use Dog Flea or Tick Treatments on a Cat?